Ships from and sold by Champion Values. 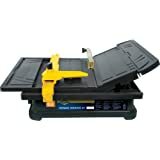 Amazon's Choice for "qep tile cutter"
The QEP 650XT 3/4 HP 120-Volt Wet Tile Saw features a powerful 3/4 HP motor that generates up to 3,600 RPM to cut ceramic tile, porcelain tile, marble, granite and stone. Its 7 in. 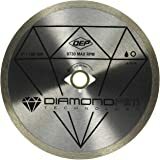 continuous rim diamond blade is positioned for cutting depths up to 1-1/4 in. and the table tilts for 22.5-degree and 45-degree miter cuts. 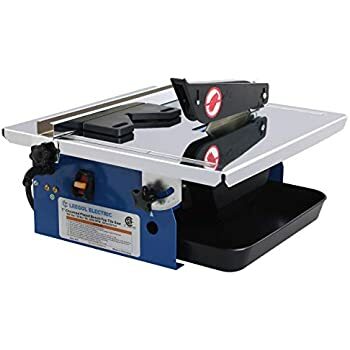 The saws durable steel table and frame have rubber foot pads for stability and its rip and angle cutting guides make accurate and repeat cuts easy. The water recirculation system and reservoir are designed to help keep your work area dry. 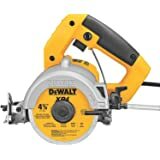 4.0 out of 5 starsGreat for smaller diy jobs. 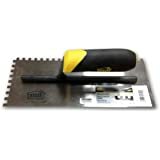 Let me start by saying that if you are a professional tile installer, this is not for you, but if you a diy'er that has smaller jobs around the house, this will work great for you. 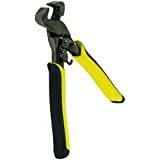 This saw is extremely light and easy to move around from place to place. It comes with everything you need to.start working, and only took about ten minutes to set everything up. As far as operation, it's simple, as all uou do is add about two cups of water and start cutting. 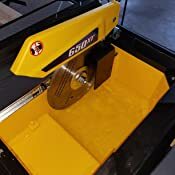 The motor is 3/4 horsepower, but it does a good job cutting through standard tile, and will leave a smooth line each time. It also comes with a miter guage and a rip fence. I will say that the rip fence is a bit hare to line up as there is to much play, but one you get it where you want it, it will stay in place. If you have the fence off tilt just a bit, it may stall out the blade as it will wedge in you cut. I also like that it has anot extended pull out top for larger tile. P.so. this is also extremely easy to clean. 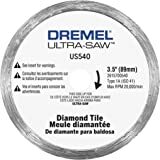 I bought my first saw on May 15, 2016 and was cutting heavy clay tiles. It worked fine for the first tiles. Last week towards the end of the job I noticed the blade (Black Spider Widow Micro Blade) got stuck frequently. I took the blade out and inspected it and noticed that the blade was engaging with the left fixed table. I called Customer Support and talked to Tim about my problem. We discussed all possible causes but he had no magic trick to fix my problem. 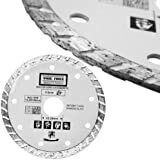 I could not see that returning the saw would let me finish the job in time so I ordered a new one from Amazon which was delivered in 2 days. I mounted the old blade and made sure that is clears the table. Everything seemed to be fine. I cut 5 more tiles and the blade got stuck again. the left table was hot. The cooling water was fine and plenty. 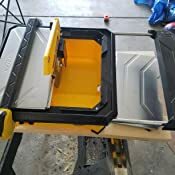 When I restarted the saw the motor could not turn the blade while it was engaged with the table. 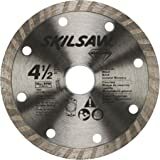 The saw is a cheap product in price and quality, you get what you pay. Luckily I could send the second saw back to Amazon and got a refund, the first saw was over the time limit of 30 days. I talked to Customer Support again and was not offered a specific help besides the recommendation to buy another product. 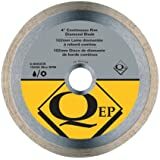 Two saws - job not done - but never a QEP product! After using it on day 2, I find it much better. 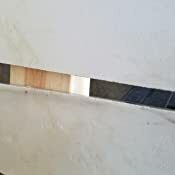 The stalling was mostly due to chips support for the saw cover causing the tile to shift a little which bound up the blade causing the stall. I now keep that area clean and the stalling is minimal. I still only give 4 stars because it's too hard to see the ruler. Just started using it yesterday. 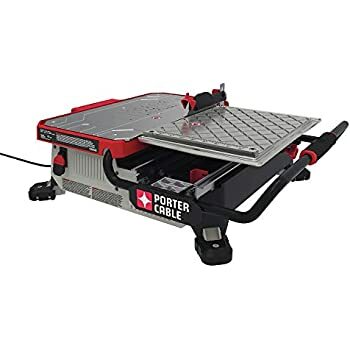 I bought this model because it had the bigger motor but so far I'm disappointed because it stalls a lot doing easy straight cuts through 1/4 inch porcelain tiles. My old 4 inch saw didn't stall this easily. I'll use it some more and see if it gets better. Unfortunately I'm passed the return time or I would send it back. Also the ruler doesn't have enough measurements on it. 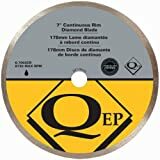 It should have 1/16 inch increments, but i just using my straight ruler and measure from the out side edge of the saw blade to set up the rip guide. So it's not a big issue just a comment. 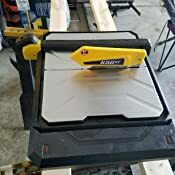 So, the saw itself, overall, is fine, especially for the price. But know that you're getting what you pay for. It cuts pretty well, but every cut winds up with the very end getting a little chipped half the time. Nothing major, but worth noting. What is major is that the design of the guide is horrendous. It's pretty flimsy plastic and is unruly to adjust. 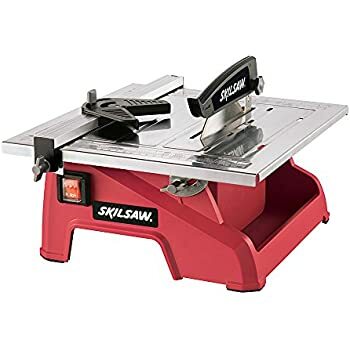 Plus, you have to eye it to ensure it's straight, so if you're gonna use this saw, you're just not likely to make perfect, straight, precision cuts. The guide/extension is what I would call a design flaw (kinda like a toy, honestly), and it's worked fine for a pretty small job, but I would not buy again, and probably should've returned it early. 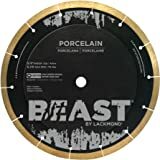 Excellent for personal use and beginner Pro. The blade that came with it worked very nicely. Check water fill line often as it was low after cutting a few 18" porcelain tiles. Keep a pitcher of water near by for easy refill. Read all instructions, always. Make a proper drip loop in the power supply cord. If you don't know what that is, Read all instructions,have fun, be safe. 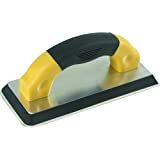 Short Story: Blade is not square and tiles get stuck after the blade length in the rip cuts. Long Version: Very disappointed in the product. I thought I had a defective product - front of blade sitting 1/16th" offset from the back . Called QEP customer service hotline - left a message and one week now and no response. So I went to home depot to buy the exact same one again (did not want to waste 3 day weekend). Same problem - now offset was 1/8". Went back again to give it a third try - same problem. So have tried three different ones with the same problem with varying degree. 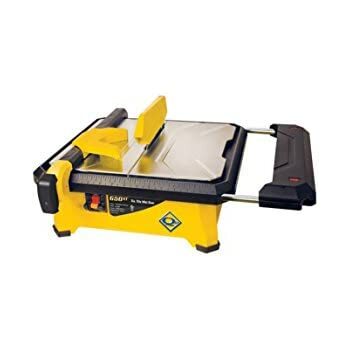 Ended with Rigid overhead tile saw. If you're looking for a tile cutter like Grandpa had that you could pull out whenever you needed it, well, this isn't it. 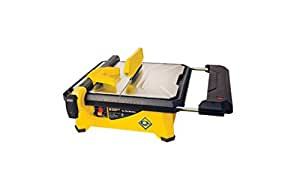 If you're like for a cheap cutter that'll get you through your small DIY project and throw away, then this is your baby! It has the very basic of setups, simple pre-set angled guides, and that's about it. The motor is undersized for the task and will lock up with the smallest of interferences, but does make it safer for the uninitiated. My one gripe for this item would be the on/off switch, the guards around it make it very hard to get to it to turn off when the blade seizes to keep from burning up the motor.